Every morning I pass by an impressive statue on my walk to campus. The protagonist is a ‎commanding figure, riding his horse through the clouds, pointing his scimitar toward the sky. It ‎stands on a tall stone base that pushes the total height to about 23 meters (25 yards). It ‎commands attention. The first time I walked past it, I immediately knew what it was. I looked at the base to confirm ‎and read KOROGLU in big metal letters. I should probably have expected to see a giant statue ‎of possibly the Turkic world’s most famous hero in Baku, but I honestly was struck. I’m sure ‎every visiting ethnic Azerbaijani from Iran like myself had the same reaction at some point. Koroglu literally translates to “son of a blind man.” He’s the main character of a series of folk ‎tales that my father would tell me as a child as I grew up in the Washington, D.C., area. By now, ‎I have forgotten much of Koroglu’s adventures, but some of the tales still resonate. I remember that when my father spoke of the Epic of Koroglu, at times he would get excited and ‎use emphatic gestures. But as he told the stories, he would snicker intermittently like it was ‎something of the past that had been replaced by more civilized Persian stories. As if it were an ‎oral tradition only known to villagers, while the more educated and elite were teaching their kids ‎stories from the Shahnameh. It was the expression of a man who knew that his culture, identity, ‎and national heroes were withering away and had come to terms with it. Koroglu was something ‎of the past. This nostalgia in some way was passed on down to me. I guess that was the reason that I became ‎so emotional upon first glance at the statue honoring this tale. 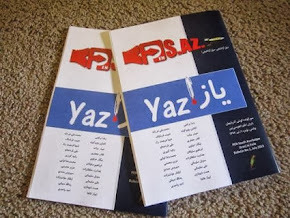 I came to Baku for several reasons: to become educated on the region, to perfect my Azerbaijani ‎language skills for which I never in my life had received formal education, and to scout possible ‎opportunities. But I think subconsciously I’m here to learn more about the intricacies of my own ‎culture that I was never exposed to, partially because of the fact that I hail from the ethnic ‎Azerbaijani minority in Iran who are denied cultural expression, and partly because growing up in ‎the States made it difficult to learn about and experience these things. It is as much a journey of ‎self-discovery as it is anything else. Before I arrived, I didn’t know what it expect. On one end, working at the Karabakh Foundation ‎and within the Azerbaijani community in D.C. gave me a grandiose impression of what ‎Azerbaijan would be like. I had seen photos of the beautiful Azerbaijani countryside and the ‎amazing construction projects, witnessed beautiful Azerbaijani dances and musical performances, ‎and had been a frequent consumer of Azerbaijani cuisine. I had kept up with Azerbaijan’s ‎economic, political, and social development. Despite this, I was still quite naïve about the ‎country. We all know that nothing compares with firsthand experience. I have to admit that after five months living here, I’m still as confused about this city as I was ‎when I came. Baku is a city of contradictions. It’s a city of both excess and insufficiency, of ‎progress and conservatism, passion and stoicism, color and blandness. It’s both European and ‎Asian, simultaneously post-Soviet and modern. And as such, my feelings about Baku are torn. If I were to say my stay here has been perfect, I’d ‎be lying. I grew in the D.C. area, where I took for granted simple conveniences. And while my ‎living conditions are by no means bad—for many things I was actually quite impressed) as my ‎hosts have done their best to ensure that I have everything I need—there are still bureaucratic ‎messes that one has to overcome. But after some reflection, I don’t think that I would want it any other way. I would be bored ‎otherwise. I came here to open a new chapter in my life, start an adventure, and now I realize ‎that this is exactly what I wanted. There is an interesting charm about the dichotomous nature of ‎this city. I think the only thing about Azerbaijan that doesn’t seem to have an opposing side is the amazing ‎sense of hospitality that is embedded into the people here. While Baku is a little more Western in orientation and has a colder “big city” feel than some other ‎parts of Azerbaijan, one can still regularly experience the generosity of strangers who are willing ‎to almost give you everything to make sure your experience is nothing short of perfect. I ‎consistently struggle to pay for my own meals and coffee when I’m out with friends. This is, of ‎course, much more pronounced when one visits the regions outside of Baku, where people live ‎simpler lives. Throughout my time in Baku, I got a chance to see a number of amazing sites. My favorite thing ‎in to do by far is to take a night stroll through the city’s gorgeous Caspian-side promenade from ‎the Old City toward the Flame Towers, which dominate the night skyline. On occasion, I’ll take ‎the funicular up to Martyrs’ Alley, which has one of the best views of the Baku. It’s a wonderful ‎blend of old and new. A quick trip to Gobustan will afford a glimpse into the lives of the regions earliest inhabitants. ‎Other great sites within the Baku city limits are the Maiden’s Tower in the Old City and the ‎Carpet Museum. Complete the day with a trip to one of Baku’s Turkish-style hamams (bath ‎house) and you’re guaranteed to sleep like a rock. The restaurants in Azerbaijan are amazing, especially those serving local fare. Anyone who enjoys ‎Middle Eastern cuisine will definitely appreciate Azerbaijani cooking. I especially find it quite ‎nostalgic because it is quite close to some of the foods that my mother and grandmother made at ‎home, but with interesting twists. It seems to be a perfect blend of different tastes for the region, ‎and it is never boring. I still reminisce about the quantity and quality of the food that I had during the fall apple festival ‎in Quba and the pomegranate festival in Qoychay. Both seemed like giant outdoor all-you-can-‎eat buffets where you could be indulging on numerous foods made with the particular fruit of ‎choice in one minute and then watching a breathtaking Azerbaijani dance performance the next. If you’re lucky enough to be invited to an Azerbaijani wedding, which is quite easy actually, ‎you’ll even get to learn some of these dances yourself. The fruit festivals usually end with ‎performances by Azerbaijan’s most renowned musicians. Azerbaijan is a country that is trying to revive its rich culture yet modernize at the speed of light. ‎The country is simultaneously exploring its past and stepping into the future. While reviving and ‎preserving its age-old music and dance, it’s also aspiring to build the tallest and most innovative ‎buildings on Earth. For me, Azerbaijan is seeing the statue of Koroglu every morning before attending class at my ‎new state-of-the-art campus. PS. Can you pls post the dates of the fruit festivals in Az.